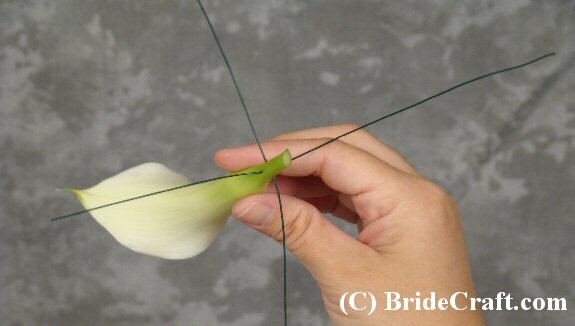 How to Make a Boutonniere! 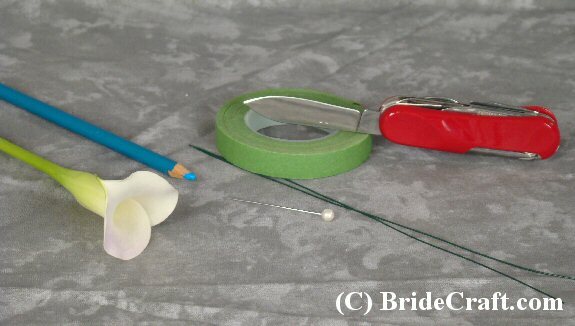 Want to know how to make a boutonniere? 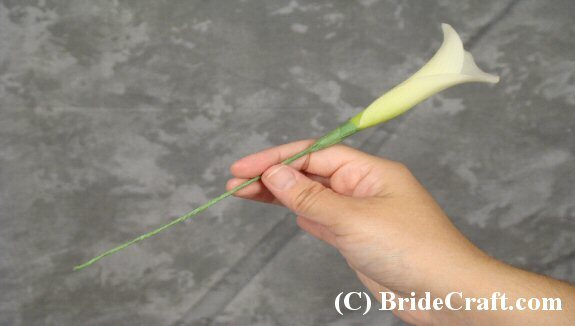 Create this insanely simple calla boutonniere! It’s elegant and modern, and a cinch to make. Pros: This project is nice and simple. Easy to customize with greenery and accents. It saves you anywhere from $5 to $15 with a florist, and adds a touch of class to your gentlemen’s attire. Cons: Like all fresh flower projects, these should be made close to the wedding date…a day or two before. 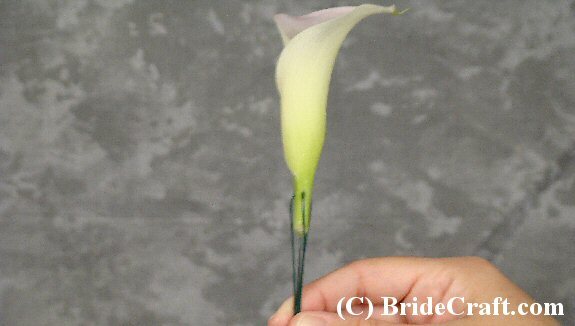 Mini callas are fairly sturdy, though, and do well in a regular house hold fridge. Do more research on other flowers before refrigerating them. 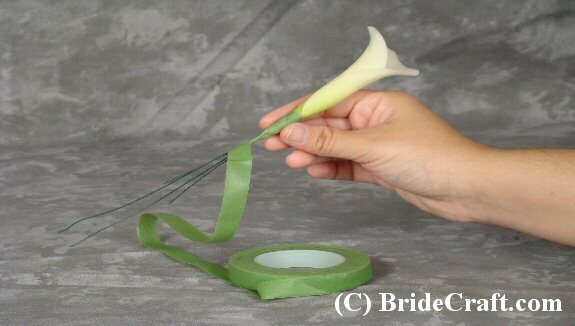 Step 1: You will need one mini calla (or other suitable flower), florist tape, small gauge florist wire, a pen or pencil, a corsage or boutonniere pin and a sharp knife. Tip: Greenery is optional! 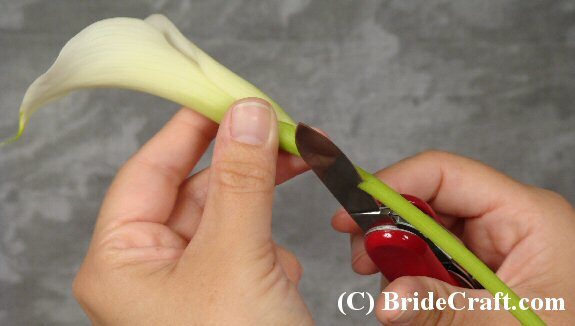 Step 2: Take your knife and cut the stem of the calla, about one inch under the bloom. 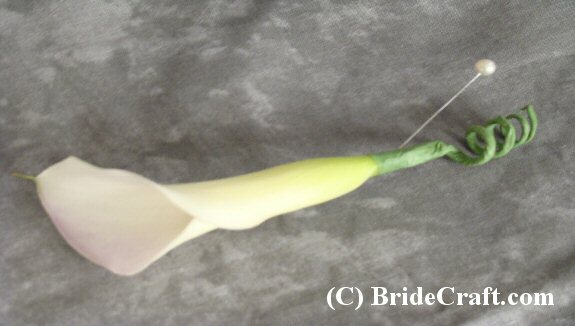 Step 3: Insert one of the wire horizontally through the stem of the calla, a bit under the head of the flower. Step 4: Insert the other wire through the stem horizontally, creating an X shape with the wires. 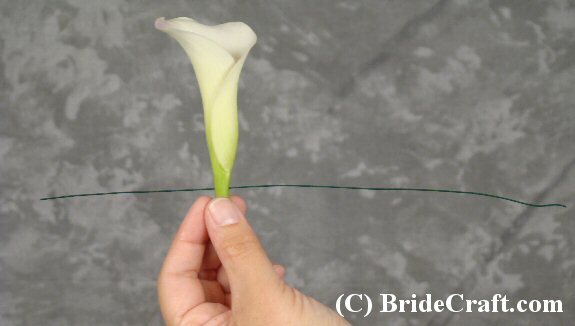 Step 5: Bend the wires down, so the calla lily is suspended vertically by the wires, as shown. 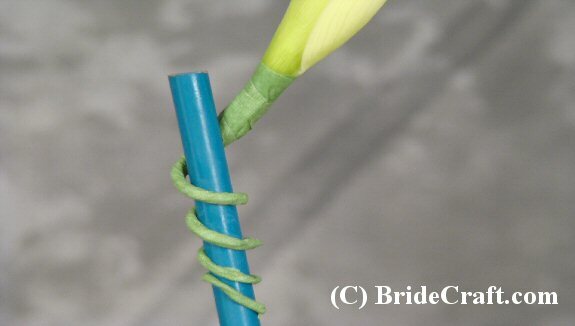 Step 6: Starting at the base of the flower head, begin winding florist tape around the stem. Continue winding down over the wires, until the wires are completely covered by the self adhesive tape. Step 7: You should have something like this. Step 8: Take your pen or pencil and wind the tape covered wire stem around and around the tube until it is nicely curled. Slide the pencil out. 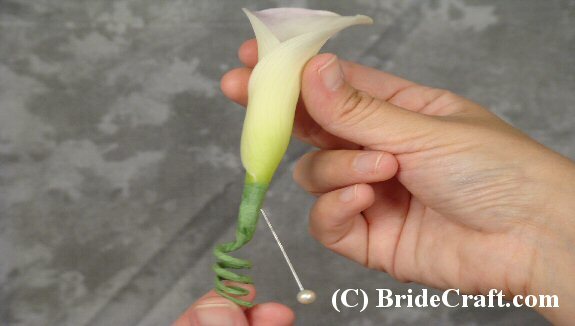 Step 9: Press a pin into the juicy stem of the calla. Step 10: And you’re done! You have just learned how to make a boutonniere. 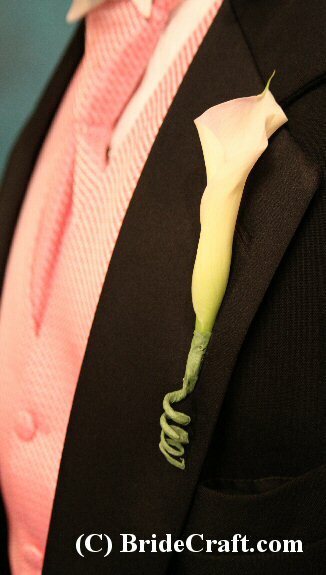 Your boutonniere should look something like this. It’s a good idea to store your boutonniere in a clean plastic strawberry container or ziplock in the fridge until use. Enjoy! Return How to Make a Boutonniere to Boutonnieres and Corsages.